Mondegreens are the phenomenon of misheard words; you think what is said is way different from what the speaker thought was said. I get this a lot, and either I’m losing the power of speech or my ability to distinguish different dictions is fading. When one retires I will be losing my faculties anyway¹, so apparently I may have started earlier than intended. I wrote a little about Mondegreens in Quotations, Not, essay 56, which I renamed Un petit, d’un petit. The actual line is "And laid him on the green", from the anonymous 17th-century ballad "The Bonnie Earl O'Murray"." The darling daughter misheard Russian vine as rushing and Roman ivy as roaming when we lived in Cornwall - entirely understandable and far better labelled. The chocolate voiced Terry Wogan often referred to "I'm in love with Malcolm" [Hot Chocolate, believe in miracles]. As with so many of these, if someone tells you what it says, that is what you hear, so I wonder how many have been misheard by others as they try to make sense of ill-heard words. Hence the growing site collection. Or cite collection. http://www.kissthisguy.com a fun collection: nicely ordered and very large. http://tvtropes.org/pmwiki/pmwiki.php/Main/Mondegreen much the best explanation. Guy Gavriel Kay wrote in the National post, copied here. I have the mostly the same content, without having read his stuff first. Deck the Halls With Buddy Holly (And Other Misheard Christmas Lyrics). Sometimes it's lack of correct enunciation, sometimes it's the speed or pitch that a lyric is delivered at, but often, a song lyric or recited poem will become famous not for what it says, but for what it sounds like it says to the uncareful ear. On television, this can happen during commercial jingles, a Theme Tune, or even as the pivotal event in a Three Is Company plot. It should be noted that a mondegreen is not quite as simple as a mistake or mishearing: they arise from the verified phenomenon that the breaks a listener hears between words often do not actually exist, but are inserted by the listener's mind (this is why you perceive speakers of foreign languages to be speaking fast and running their words together): had Hendrix actually been singing "kiss this guy," rather than "kiss the sky," it might well have sounded exactly the same, and thus is a common mondegreen with such lyrics. Intentional mondegreens are a staple of folk, parody, comedy and "novelty" songs; for example, the band They Might Be Giants uses several in their songs as a reference to their childhoods in the 1950s and 1960s. Weird Al Yankovic is also known for referencing common mis-hearings of popular songs in his lyrics, often in ways which sound almost identical to the original. This is distinct from the more general use of parody lyrics, as the mondegreens are usually common, pre-existing ones which the lyricist is referencing, rather than a complete invention, as a way of playing with the trope. The German author Axel Hacke has published various entertaining books about mondegreens. (It also mentions some famous English Mondegreens, like "round John Virgin", "Olive the other Reindeer", "Gladly the cross-eyed bear" and of course the Trope Namer.) Dave Barry also included an entire chapter about misheard lyrics in Dave Barry's Book of Bad Songs. Several animutations are based around a long series of intentional mondegreens, usually involving faux "lyrics" accompanying a confusing (often foreign-language) song. Someone who has read the faked lyrics often has trouble associating the real ones with the song afterwards. Finding soramimi (Japanese mondegreens, vaguely translating to "tricks of the ears") in songs from other languages is such a popular pastime in Japan that one well-known comedy show devotes a regular segment ("Soramimi Hour") to it. For instance, the refrain of the Scorpions' "You Give Me All I Need" was interpreted as "Yukimi onanii" — "watching the snow fall while pleasuring yourself." A soramimi of "Moskau" by Dschinghis Khan, can be found here. In July 2008, the 2008 update of Merriam-Webster's Collegiate Dictionary finally enshrined the word "mondegreen" in its pages. To celebrate this momentous event, Merriam Webster Online began soliciting examples from the public as part of a short-lived publicity campaign. A series of books (and page-a-day calendars) of mondegreens were put together by Gavin Edwards, the first of which is called 'Scuse Me While I Kiss This Guy and Other Misheard Lyrics. AmIRight.com has a dominating portion of its site dedicated to showcasing an ever-expanding list of mondegreens, likely including those listed here. Yes, you can even submit your own. September 2011 (so after I’d written about it within the family and failed to upload that content), Vic Fleming wrote (well, he writes well) in his column I Swear / Icewear. he points out that wikipedia cites Jon Carroll (Mondegreens Ripped My Flesh, below). Fleming found this, from Carroll, pointing out that it predates 1954, making it a pre-mondegreen. The Christmas short Olive The Other Reindeer has this [the title] set off the plot. Upon hearing on the radio that one of Santa's reindeer is injured and that they'll be counting on "all of the other reindeer," Olive decides that Santa did not say this, but the title, and that she is not a dog at all, and that she is in fact, a reindeer. So she goes to the north pole to prove it. A bus driver later tells Olive that he used to think the pledge of Allegence [sic] was about him, Richard Stands. As in, "And to the Republic, for Richard Stands." I couldn’t get the site to load (May 2013), but I had a (possibly mixed from across several sites) copy in a family email. I then (today) removed some of the repetition from above. Here at the Center for the Humane Study of Mondegreens, we've been totting up the entries and applying the latest statistical correlative methods, even using our toes, to arrive at a semi-definitive answer. For those of you who have not yet received the pamphlet (mailed free to anyone who buys me an automobile), the word Mondegreen, meaning a mishearing of a popular phrase or song lyric, was coined by the writer Sylvia Wright..... They hae slay the Earl of Murray, And Lady Mondegreen. Poor Lady Mondegreen, thought Sylvia Wright. A tragic heroine dying with her liege; how poetic. When it turned out, some years later, that what they had actually done was slay the Earl of Murray and lay him on the green, Wright was so distraught by the sudden disappearance of her heroine that she memorialized her with a neologism. There are Mondegreens in familiar phrases. A friend of Adair Lara's believed for years that we live in a "doggy dog world" populated by pushy people with a "no holes barred" attitude, while a friend of Carolyn Stone's believed that World War II was fought between the Zees and the Not Zees. 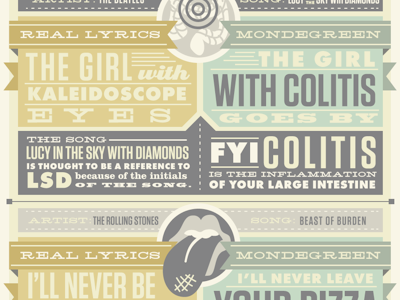 But the overwhelming majority of Mondegreens come from song lyrics. Remember on the East Side and the West Side when me and Mamie O'Rourke "risked our lives in traffic"? Remember when Simon and Garfunkel sang hauntingly about how "partially saved was Mary and Tom"? Remember that touching moment in "I'm in the Mood for Love" when the singer reveals his favourite nickname for his beloved? There are many more; many more -- I have envelopes stuffed with them. But our eyes grow weary and our stomachs grow hungry; we must now, in the words of the old Christmas carol, "sleep in heavenly peas." See also Lady Mondegreen, which is about something similar happening with character names in other works. A Gag Sub for a music video will probably be filled with those. Note: Examples below should be famous mondegreens or ones referenced in other works. Your own misheard lyrics need to go into the Troper Tales section.